THE FIVE-YEAR ENGAGEMENT is a banal, over-long romantic comedy firmly in the will-they-won't-they-oh-get-on-with-it. 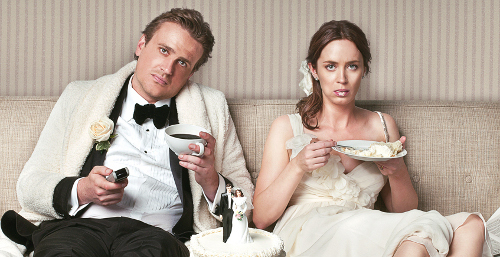 Jason Segel and Emily Blunt as two people so manifestly right for each other, that one can only lose respect for them and their relationship by the amount of faux-obstacles they put in the way of the final, compulsory, over-the-top, wedding scene. He's a successful San Francisco chef who moves with her to Michigan for he dream university job. Reduced to selling tacos he becomes resentful, and she resents his resentment. A mild indiscretion on each side leads to a temporary break-up and a third act epiphany and reconciliation. I say that very quickly - in reality it's an hour of really dull cinema. Whatever comedy there is, is provided by Community's Alison Brie as Blunt's sister, complete with pitch perfect English accent, and her husband. They even steal the show at the leading couple's wedding! Poor Rhys Ifans is saddled with the most unbelievable Professor in film, and Mindy Kaling, as his research assistant, is utterly wasted. What's really sad is that the dilemma posed by this movie is a real one. Lots of us have been in relationships where one person has to take a back seat to the other's career, whether because someone had to move to get a degree or a job, or whatever. It's a real everyday problem. This movie had the potential to introduce some authentic, clever, observational comedy. But I'm guessing that neither screenwriter has been in that position and that neither really gets it. Overall, this is the second piss-poor film that Jason Segel and writer-director Nicholas Stoller have been involved with since GULLIVER'S TRAVELS. Enough already. THE FIVE-YEAR ENGAGEMENT was released earlier this year in the USA, Canada, Australia, New Zealand, Iceland, Serbia, Slovenia and Taiwan. It is released today in the UK, Ireland and Lithuania. It opens next weekend in Croatia, the Netherlands, Russia, Poland and Turkey. It opens on July 5th in Israel, on July 12th in Germany, on August 1st in Belgium and France, on August 10th in Mexico, on September 7th in Spain, and on September 28th in Italy. The movie is rated R and is 124 minutes too long.